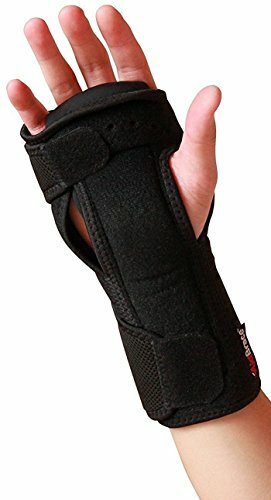 AidBrace Night Wrist Carpal Tunnel Support Brace helps support injured and painful wrists from Carpal Tunnel, Cubital Tunnel, RSI, Arthritis, Tendonitis, Wrist Sprains and other type of Wrist Injuries. This brace is used while sleeping to ensure correct wrist posture in a straight natural state. Cushioned beads help with providing maximum comfort to the palm and the stabilizing splint helps with providing a rigid structure to keep the wrist from excessive movement while sleeping. We're so confident in our product, we're offering a 100% MONEY BACK GUARANTEE! ✅ AIDBRACE GUARANTEE - We're confident our high quality wrist brace will give you the support and comfort you desire, that if you don't see results in your wrist pain that we offer a 100% satisfaction guarantee or your money back! If you have any questions about this product by AidBrace, contact us by completing and submitting the form below. If you are looking for a specif part number, please include it with your message.